White males who commit crimes are routinely let off with not punishment or a slap on their wrist. 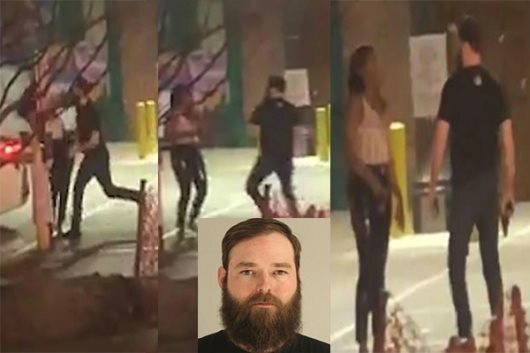 AFRICANGLOBE – A brutal assault allegedly over parking in Deep Ellum caught on-camera lead to the arrest of a bartender named Austin Shuffield, according to an arrest warrant. Witnesses watched in horror asa drunk Shuffield attacked the 24-year-old victim Wednesday night. According to Dallas police, it all started when the woman stopped after allegedly driving the wrong way down Elm Street. That’s when Shuffield, 30, got out of his truck to ask her to move out of his way because she was allegedly blocking the parking lot exit. The video shows the drunk Shuffield and the victim in the heated argument. At one point, Shuffield pulls out what appears to be a gun and holds it behind his back. After more words are exchanged, he smacks the woman’s cell phone out of her hand as she was dialing 911. She reacts by punching him. The woman was crouched over, cradling her head as Shuffield beat her mercilessly. Shuffield then kicks her cell phone violently on the ground. We cannot confirm who the victim is or how badly she was injured. Next articleDid This Actress Really Accused Oprah Of ‘Pimping’ Her Out To Harvey Weinstein?